In the wake of the “Brexit” vote, multiple mainstream news sources are linking the emergence of the E.U. to a long-range plan by the CIA and German industrialists to return Europe to German control. As described in our previous article, linked HERE, we looked at a stunning article in the Telegraph.UK that details how the European Union was funded and built by the U.S. State Department and the CIA. At first glance this would seem a logical project in rebuilding war-ravaged Europe after World War Two. However, much like the process that took place before that war where the U.S. industrial empire funded the rise of Hitler as a bulwark against Bolshevism, that plan is being repeated again in the E.U. “Chancellor Merkel has managed to use the hard-earned money of German taxpayers to bail out profligate Eurozone countries without suffering any political fall-out. This is unlikely to remain the case and Mrs Merkel knows it. “Frau Merkel called for a ‘stronger coordination of policy’ and ‘a new quality of cooperation’ within the Eurozone. “If the euro is to survive — and with it the European project — the other 16 Eurozone countries will have to be like the Germans. Indeed, they must lose the freedom not to be like the Germans. “This would entail a loss of sovereignty not seen in those countries since many were under the jackboot of the Third Reich 70 years ago. “Every spending department in every government in the Eurozone would have its policy made in the old capital of Prussia. And if the people did not like their governments being left with fewer powers than a county council, that would be tough. The alternative is ruin. “The foreign ministers of France and Germany are due to reveal a blueprint to effectively do away with individual member states in what is being described as an “ultimatum”. “Controversially member states would also lose what few controls they have left over their own borders, including the procedure for admitting and relocating refugees. “It seems difficult to imagine that the rest of the EU will close ranks and move in the direction of greater integration quickly. Simply, there is no political will. But others see the Brexit vote as an opportunity to push ahead with the European elite’s long-cherished dream of creating a United States of Europe. Spain’s foreign minister Jose Manuel Garcia-Margallo has called for “more Europe” whilst Italy’s finance minister, Carlo Padoan, is advocating a common budget for the eurozone states. Please note from the first paragraph above that member states will be denied the right to have their own army. While some officials are recommending a “go slow approach”, the plan is set to evolve. “According to a news report in the June 7th German Economic News (Deutsche Wirtschafts Nachrichten, or DWN) headlined “Merkel entmachtet BND: USA kontrollieren Spionage in Deutschland” or “Merkel Ousts BND: US to Control German Espionage,” a new law will soon be passed in the German parliament and be approved by Chancellor Angela Merkel, which will make Germany’s version of the CIA, the Bundesnachrichtendienstes (BND), nothing more than a branch of the CIA. “In a push to modernize their navies, Germany and Poland have agreed to work together, establishing a joint submarine operating authority. The memorandum signed by both countries will establish a joint operational control center in Glucksberg, Germany. The Polish Navy also intends to connect its submarine fleet to the German military’s broadcast control system. Two Polish naval officers will be permanently stationed in the city. “The spokesman also indicated that other countries could eventually be added to the joint authority. An offer has already been extended to Norway, and given the existing relationship between the three countries, it doesn’t seem far-fetched to assume Oslo will accept. Four of Poland’s U-boats were acquired from the Norwegian Navy, and Berlin expects to replace six of its subs with ones from the Scandinavian country. The joint operations center could serve as a model for NATO. Germany intends to build a new operations center in Rostock, along the western edge of the Baltic Sea. This could serve as a command center for the alliance’s Multinational Maritime Component Command, according to the German spokesman. The Rostock center could, theoretically, include representation from all NATO members along the Baltic. These and other examples demonstrate that Germany has achieved all of it’s WW-2 objectives by loading up southern Europe with debt and then bringing in a big “tow truck” for the spoils. Author Curt Riess, in his classic 1944 expose’ “The Nazis Go Underground” described in real time how the Nazis were preparing for The Fourth Reich, by fleeing with treasure looted from Europe and expanding into international business. This allowed them to ally with similar industrialists, including those in the U.S., to create a “fascist international”. Riess quoted Germany’s Marshal von Rundstedt as saying that Germany’s neighbors could be defeated by “organized underfeeding, which in this case is better than machine guns”. This entry was posted on July 3, 2016 at 7:51 pm and is filed under Hidden History, Tell the truth and run !. You can follow any responses to this entry through the RSS 2.0 feed. 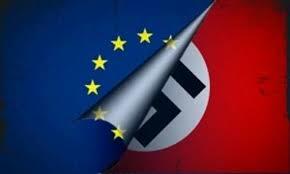 2 Responses to The “Fourth Reich” In The E.U. Perhaps this is why the European aristocracy is so bent out of shape about the Brexit vote and Britain’s likely departure from the EU? Because the Brits are the only political stalwart with enough of an economic and political anchor to prevent Germany from retaking the entire European continent. That is of course, unless you consider Russia a roadblock to Germany’s imperial designs but now that Russia and its devilish leader Vladimir Putin are back to being public enemy #1 in the eyes of the West, we cannot rely on their military might as an ally if the German Reichstag were to mount an offensive.